Noir Naturals wants to reward one (1) individual who actively works to reuse, reduce, recycle or use other sustainable practices. As a green company whose policies and practices have earned us silver level green certification, we want to acknowledge the efforts of individuals who are proponents of sustainability. Individuals who meet the award criteria noted above can nominate themselves or be nominated be someone else. All nominations for the 2014 Green Living Award are to be made by April 11th, 2014. Information such as the name of the person being nominated, email address and/or telephone number, and nominee’s sustainable practices or green living are to be supplied in order for the individual to be considered for the award. All nominations will be reviewed and Noir Naturals will contact the nominee to confirm details of his/her sustainable practices or green living. All confirmed nominations will be submitted for the drawing and the name of one (1) individual will be randomly selected from among all confirmed nominations. 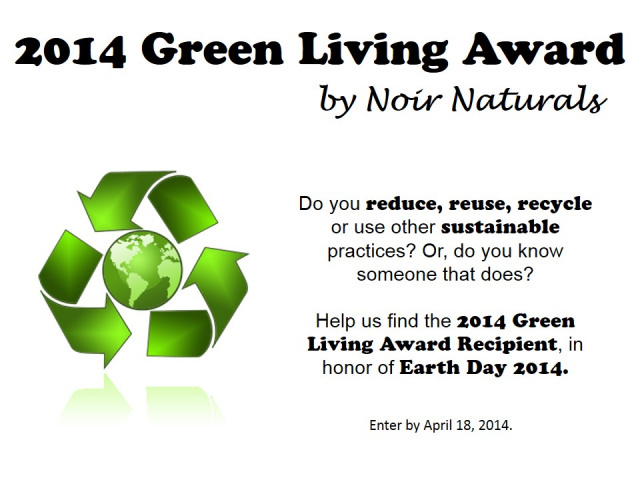 The winner will be announced on social media (Facebook, Twitter, and Google+) on Earth Day (April 22nd, 2014), as well as announced in the May 2014 newsletter and posted on the website.The winner will be presented with a $50 gift e-certificate from Noir Naturals and be named as the 2014 Green Living Award Winner. We're even rewarding the person who nominates the award winner! We want to appreciate the folks who take the time to let us, our loyal customers and the south Louisiana community we operate in, know how others are practicing green living. The person who nominates the award winner will receive a $20 gift e-certificate from Noir Naturals.